The 2015 Ducati Superbike family presents a new major player in the category: the 1299 Panigale. The latest arrival at the Bologna-based firm, with its 1285 cm3 Superquadro engine, raises the standards once again in terms of performance for supersports bikes on the international market. Thanks to incredible torque with a value of 144.6 Nm at 8,750 rpm, a dry weight of 166.5 kg (367 lb) and maximum power of 205 hp at 10,500 rpm. With an extremely high power to weight ratio, the 1299 Panigale has become a new benchmark standard for very high performance bikes. The latest generation of Ducati Superbikes builds upon engineering and design solutions introduced on the 1199, rendering the concept of the Superbike for the road still more extreme. The new 1299 Panigale has more torque, it’s more powerful and responsive than the 1199, the bike it replaces, while at the same time it’s easier and safer to ride thanks to the use of innovative solutions devised by Ducati Corse, to allow everyday fans to experience the technology of world champions. The 1299 Panigale has the Superquadro, the most advanced and powerful twin-cylinder engine produced on the planet, which is made even more extreme by pistons with a diameter of 116 mm, a value that’s used for the very first time on a supersports road bike. The motorcycle has evolved in terms of chassis set-up too: the innovative monocoque chassis now has a steering head angle of 24° to guarantee increased agility when cornering, while the fork pivot is 4 mm lower allowing for increased rear traction in a variety of situations. The new electronic kit, studied specifically for the 1299 Panigale and integrated in the three different Riding Modes, makes it even more high-performance. Thanks in fact to the presence of the Inertial Measurement Unit (IMU), Cornering ABS is made available, along with Ducati Wheelie Control (DWC) and, on the S version, the Öhlins Smart EC, an event-based control system for the suspension. Moreover, the Ducati Quick Shift (DQS) now works also during down-changing, to further improve track performance and to make the bike more easy to use on a daily basis. 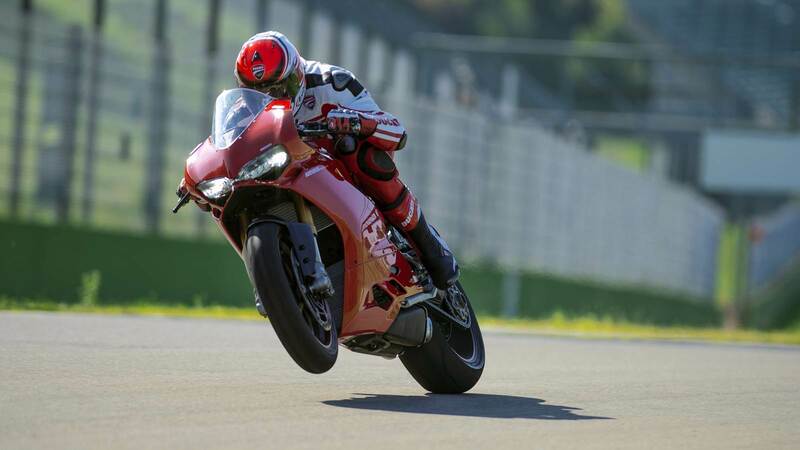 On the 1299 Panigale, the Ducati Traction Control (DTC), Ducati Wheelie Control (DWC) and the Engine Brake Control (EBC) have been optimised by an automatic calibration system which allows for easy changes in tyre size and final drive ratio. Every single detail of the Panigale is a tribute to the legendary sports tradition where Ducati’s roots lie. Just as the famous 916-996-998 series, which recently celebrated its twentieth anniversary and is still a unique and instantly recognisable example of Italian style, so too the 1299 Panigale with its incredibly contemporary and practical design follows in the footsteps of the 1199 Panigale which, thanks to its design, won the prestigious Compasso d’Oro award. As well as improving the aerodynamic penetration, the wider nose fairing and more protective windshield make the fairing of the new 1299 Panigale still more aggressive, thanks also to the wider front air intakes. The new tail fairing, divided into two sections, completes the form of the 1299 Panigale, which also has new lateral ducts and mirrors. Moreover, the 1299 Panigale is fitted out with a new and more comfortable saddle and with machined aluminium footrests, to provide maximum on-road grip. For 2015 Ducati also introduces the Panigale R, which is the homologated base for its World Superbike machines and is essentially a road-legal race bike with indicators and lights. Fitted with the 1198 cm3Superquadro engine, thus falling within Superbike displacement limits, it boasts titanium intake and exhaust valves and rods, two-ring pistons and an extremely lightweight crankshaft which is balanced with tungsten inserts, to guarantee a maximum power of 205 hp at 11,500 revs/minute and a torque of 136.2 Nm at 10,250 rpm. The Panigale R is also fitted with Öhlins mechanical suspension, an adjustable swingarm pivot and the same electronic technology as the 1299 Panigale, as well as a lithium ion battery which means a reduction in weight of over 2 kg, making it a total of 6 kg lighter than the 1199 Panigale R.
By adding a name to the number, 1199, the Panigale went against the tradition of Ducati Superbikes, which had previously always been known by just a number. The name refers to the district of Bologna where the company headquarters is, and has always been, and so strengthens the link with the Ducati home territory. Thanks to its technological features, the 1199 Panigale opened the way for a new frontier of supersports bikes, with its Superquadro engine and monocoque chassis. With the 1299, Ducati pushes the characterising features of the 1199 Panigale still further forward. The 1299 is an object of desire that will fill the dreams of fans throughout the world. The new 1285 cm3 twin-cylinder Superquadro provides 10% more torque compared to the power unit of the 1199 Panigale and makes for an even more responsive throttle. With the 10 hp of extra power, the 1299 Panigale exceeds a maximum power of 205 hp – an incredible level for a twin-cylinder road bike – while the updated chassis specifications make the bike more agile, at the same time providing better traction out of every corner, a condition that’s necessary in order to make the most of the incredible maximum torque value of 144.6 Nm. Each and every detail of the 1299 Panigale is a tribute to the legendary tradition of sports bikes that Ducati has personified since the beginning: the parts are not only efficient and practical, they’re also minimalist and have an essential style, created with skill to become works of motorcycle art. The horizontal twin headlamps are integrated as part of the front intake ports and give the front view of the 1299 a truly racing style. While the 1299 Panigale has LED side-lights and bulbs for the headlights, the 1299 Panigale S version has full LED lighting. The Superquadro makes use of a combined gear train configuration to control its camshafts. A chain connects the crankshaft to a gear fixed to the head. This gear has a double set of teeth – the set driven by the chain, and another set which drives two other gears fixed respectively on the intake and exhaust camshafts. The position of the gears at the ends of the camshafts is adjustable to allow for optimum timing precision. At the end of the exhaust camshaft of each head, there’s a centrifugal decompressor. During start-up, the device allows the profile of the opening lobe of the camshaft to be modified, causing a slight lift of the valve which reduces pressure in the combustion chamber during the compression stage. This reduction in compression pressure enables the use of a very small electric starter and a much smaller battery than in the past. Once the engine fires, its idle rpm and the resulting centrifugal force modifies the configuration of the device to cancel the effect of the raised valve, returning the engine to its normal functioning condition. Transmission is managed by a six-speed gearbox together with a wet clutch that has a progressive self-servo mechanism which allows the load on the disks to be increased without compromising the lever force required by the rider to operate the clutch. This result is an optimal combination of the requirements for a high torque transmission together with a high level of comfort for the rider. Under sports riding conditions, with repeated downshifting and aggressive deceleration, the same mechanism reduces pressure on the clutch disks, allowing them to work in slipper clutch mode. In addition, the new Superquadro has an innovative gear sensor, devised for MotoGP, which is indispensable for getting the most out of the new electronic gear-changing strategy. The 1299 Panigale provides a new benchmark for electronic systems. The highly advanced electronic kit is supported by the Inertial Measurement Unit (IMU) which measures acceleration in relation to three axes and calculates the bike’s angle of roll and pitch. The IMU has made it possible to increase the performance of the electronic kit, introducing Cornering ABS, Ducati Wheelie Control (DWC) and, on the S version, Öhlins Smart EC, an event-based control system of the suspension. For the first time, the Ducati Quick Shift (DQS) functions also for downshifts. Furthermore, the 1299 Panigale is equipped with the Ride-by-Wire (RbW) system, the Ducati Data Analyser (DDA+) and the Ducati Riding Modes, which interact differently with the Ducati Traction Control (DTC), the Ducati Wheelie Control (DWC), the Ducati Quick Shift (DQS), the Cornering ABS, the Engine Brake Control (EBC) and, on the S version, also the Öhlins Smart EC suspension. On the S version, the impressive provision of electronic devices also includes auxiliary buttons on the handlebars, as on race bikes, to regulate the DTC, DWC or EBC systems during track use.